Opinion: Trump's Saudi Statement Is A Moral Abdication And Strategic Failure The statement will further empower the Saudi leadership to lash out in pursuit of other priorities in ways that damage our shared interests, writes former U.S. Ambassador to Israel Daniel B. Shapiro. President Trump shakes hands with Saudi Crown Prince Mohammed bin Salman at the White House in March. Daniel B. Shapiro (@DanielBShapiro), a distinguished visiting fellow at Israel's Institute for National Security Studies, served as U.S. ambassador to Israel from 2011 to 2017 and senior director for the Middle East and North Africa at the National Security Council during the Obama administration. 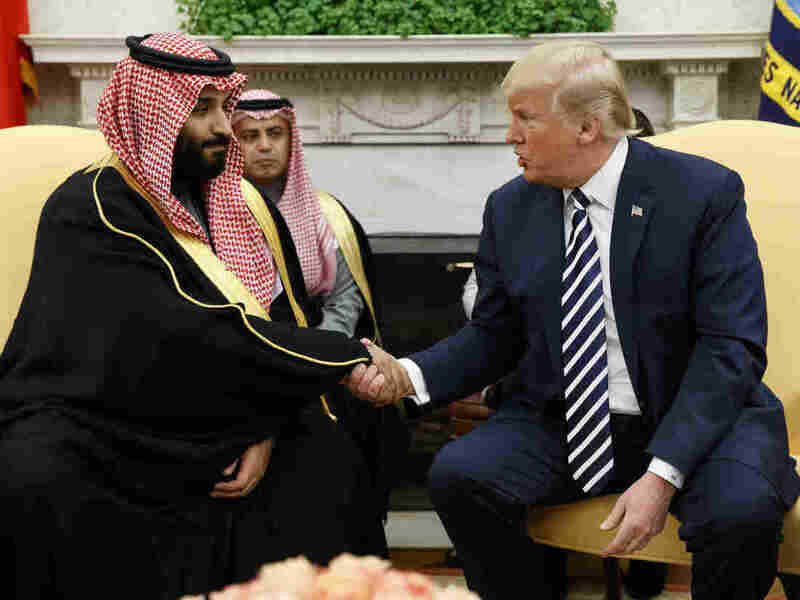 President Donald Trump's bizarre statement on Tuesday had a clear intent: Let Saudi Crown Prince Mohammed bin Salman off the hook for the vile murder of Jamal Khashoggi and move on. For that, it was justifiably panned as a betrayal of American values, which should hold the state-ordered killing of a journalist critic unacceptable. But the strategic logic was even worse. Trump's exclamation point-filled missive argued that Saudi Arabia is a key partner of the United States in containing Iranian aggression and confronting radical Islamist terrorist groups. He touted vastly inflated estimates of Saudi investment in the U.S. economy and purchases of American military equipment. And he gave Saudi Arabia credit for responding to U.S appeals for lower oil prices. In Trump's telling, choosing implausible Saudi denials over the high confidence of the U.S. intelligence community in the crown prince's guilt is all in the service of sustaining a partnership that serves U.S. interests. He has it exactly backwards. Saudi Arabia has indeed been a key partner of the United States for many decades, and its leadership of a bloc of moderate Middle Eastern states aligned with the United States is desirable. And no U.S. official working on this relationship has had any illusions about a monarchy that denies its citizens the freedoms they deserve and has engaged in unacceptable human rights abuses. The problem is that under Mohammed bin Salman's leadership, Saudi Arabia has lurched toward impulsiveness, unpredictability and brazenness, which damage our ability to advance common interests. Take the Saudi campaign in Yemen. While justifiably striking at Iranian-backed Houthi rebels who launch rockets against Riyadh, Saudi forces have shown utter disregard for massive civilian casualties, leading to unspeakable suffering. It reached the point last week where the U.S. military announced it would no longer provide refueling support for Saudi planes. Or consider Mohammed bin Salman's boycott of Qatar. Saudi Arabia's Gulf neighbor has pursued provocative policies, supporting the Muslim Brotherhood, cooperating with Iran and tweaking Saudi rulers on its Al Jazeera network. But the heavy-handed response of Saudi Arabia (joined by the United Arab Emirates) has had little effect beyond deepening divisions among key U.S. allies in the Gulf and allowing an easily resolved dispute to fester and divert attention from common threats like Iran. Not enough? In a classic own-goal last year, the crown prince forced the resignation of (and briefly appeared to detain) Saad Hariri, the pro-Western prime minister of Lebanon. Intended to weaken Iran's Lebanese proxy, Hezbollah, the move backfired badly. And over the summer, Saudi Arabia virtually cut off relations with Canada — Canada! — over two tweets calling for the release of incarcerated Saudi human rights activists. Khashoggi's murder, with its Hollywood mystery plot and bumbling villains, may have captured the public's imagination more than out-of-sight wars and diplomatic disputes. But it was merely the latest evidence that the Saudi leadership is wildly out of control. This is tragic for what it means for Saudi Arabia. Mohammed bin Salman, a leader with promise who has promoted some genuine reforms, clearly prioritizes the brutal crushing of any dissent and pursuing fruitless regional adventures over regional stability and the well-being of his people. But it is also damaging for U.S. interests. The country that should be an anchor for the United States' regional strategy has so damaged its own reputation that Germany is cutting off arm sales and other European governments are considering such a step, while Congress is considering bipartisan punitive measures. Those would be in addition to sanctions already imposed on 17 Saudi individuals by the Treasury Department. So much for the Saudi anchor. Trump erred badly by disregarding the immorality of Khashoggi's murder. Other countries do terrible things, but we expect U.S. allies, at a minimum, not to implicate us in their crimes. The mafia-style hit on a U.S. permanent resident crossed that line. And Mohammed bin Salman's getting away with it will embolden other tyrants to unabashedly murder their critics, believing the United States will be silent. After all, in the words of Secretary of State Mike Pompeo, "It's a mean, nasty world out there." That's a darker, more brutal world, that we should not want to live in. But U.S. interests will be harmed in even more fundamental ways, particularly as they relate to Iran. Trump's statement accurately described the threat Iran poses, from sponsoring terrorist groups, to abetting the slaughter in Syria, to threatening Israel and building ballistic missiles. We do need a reliable Saudi partner to help confront an aggressive Iran. But the problem is, with Mohammed bin Salman in charge, we don't have one. What we have is a Saudi Arabia that may share certain strategic interests with the United States, and may be pursuing a limited set of reforms, but which is led by a reckless, vindictive, violent man whose personal vendettas actually weaken strategic coordination against Iran. That harms U.S. interests. Trump's statement is both an abdication of principle and a strategic failure, because instead of acting as a restraint on Saudi excesses, it will further empower the Saudi leadership to lash out in pursuit of other priorities, in ways that damage our shared interests. There should be no higher priority for Congressional oversight, and legislative measures to rebalance the U.S.-Saudi relationship, come January.